You could win $250 towards Security and Automation services! Call your local office to find out more! Easter Sunday is Sunday, April 21st! Please Click HERE to view the brand new magazine provided by Eastex Telephone Coop, Inc.! Are you ready to win $250 towards Security and Automation?! Call your local office to see how you can apply! Click HERE to view the full March 2019 Newsletter! Introductory Security and Automation rates are happening NOW! Click HERE to view the full February 2019 Newsletter. With the new year, comes new online scammers! Keeping your information private is important to us so we would like to remind you to never click on suspicious emails, ads, or texts. Please be aware that Eastex Telephone Cooperative, Inc. does not send promotions via email, text, or pop up ads. If you see any of these please report them immediately as they are a scam. 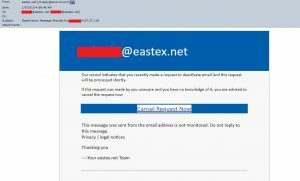 You may also see an email that looks as if it is from an Eastex member. If you ever have any questions or feel you received something in error, it is best to contact your local office before proceeding with anything! Here is a recent example of an email scam. If you are looking to give back this season, please bring an unwrapped toy to any of our locations. We have become a certified drop off location for Toys for Tots this year! We also have FREE connect fee for any feature and access lines this month! Contact our office for further details. Click HERE to view the full December 2018 Newsletter. Eastex Telephone business offices will be closed Thursday, November 22 and Friday, November 23 for the Thanksgiving Holiday. Eastex Telephone Offices will be closed Monday, September 3 in observance of Labor Day. Grandparents hold a special place in our hearts and we want to wish all grandparents a special day on Sunday, September 9th. Continue viewing the full newsletter for details on how your devices affect your internet speed! Beat the Heat with our 2 great specials!! Upgrade your DSL to receive two months free AND be entered to win an Amazon Firestick! Refer a friend, family member, or neighbor and you BOTH receive a Netflix Gift Card! Restrictions may apply. Contact our office for full details.